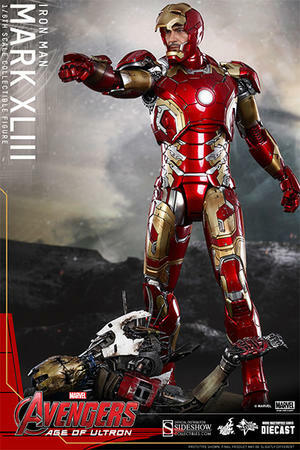 Hot Toys are thrilled to jump start the Avengers: Age of Ultron collectible series by presenting the Iron Man Mark XLIII Sixth Scale Collectible Figure! 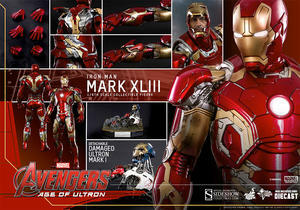 It is also the newest addition in the MMS Diecast Series which consists of diecast material and a realistic design to look even more like the armor as it appears in the blockbuster film. 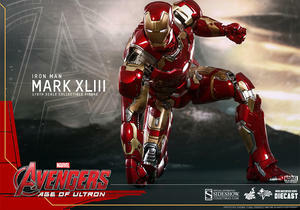 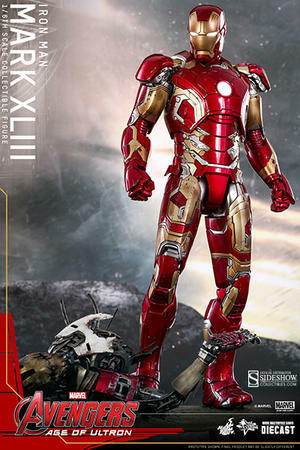 The movie-accurate Mark XLIII Collectible Figure is highly detailed and specially crafted based on the image of Robert Downey Jr. as Tony Stark/Mark XLIII in Avengers: Age of Ultron, featuring a newly painted Tony Stark helmeted head sculpt, metallic red, gold and silver armor with weathered effects, LED light-up functions, and a specially designed diorama base with a damaged Ultron Mark I.
Kick-off your Avengers: Age of Ultron collection with this amazing Iron Man figure!